The green onions are a common food ingredient in many cuisines across the world because of their specific and refreshing taste which adds up to the flavor of many traditional dishes. However, there are many equally delicious substitutes for the green onions which are interesting for people who like to add some exotic ingredients to make their meals unforgettable. Also, some people don’t like the taste of green onions, or they’re allergic to some of its natural traits. Therefore, a green onion substitute might be the right solution for all those people who want their meals to have that delicious final touch with a taste of onion that is well-mixed with other ingredients. Each green onion substitute that we will mention here features a unique onion taste which can expand your palette of tastes and become your all-time favorite later on. What are the green onions? How to Use Green Onions in Meals? What are the green onions? Sometimes called scallions and spring onions, the green onions are standardly used in Asian cuisines, but many other world cuisines are known for frequent use of green onions in meals. The green onions have a distinct taste that features a sharp flavor with the white part of the onion having the strongest taste. Because of the strong taste, the opinions are divided when it comes to the frequent use of green onions in meals. Some people find this sharp onion taste attractive, but others find it too strong and thus reluctantly include the green onions while cooking. Therefore, a green onion substitute won’t feature such a strong taste as it’s more versatile which means that it can be used in a variety of different meals and significantly add up to their flavor. How to Use Green Onions in Meals? Some people find themselves puzzled about which parts of the green onions are best used for cooking. Also, some of the most common problems with the preparation of green onions is a question whether all of the green onion parts are edible. In most recipes which list the green onions among the ingredients, you’ll only need the white root and the pale green portion which is just above the root. Also, the green leaves have a purpose as they can be thinly sliced and used as a delicious garnish for a big number of meals. Generally, the green onions feature long, straight green leaves and straight bases, rather than bulbous-shaped. Look for the green onions with the straight bases as such a trait means that the onions were harvested when they were still young before they had time to develop into a large, rounded mature onion that features a notably different taste. It’s also important that you choose green onions with fresh-looking green tops and clean white ends because these traits provide you with instant insight into the freshness of the vegetables. When buying green onions for a recipe, it’s good to keep in mind that 1 medium green onion is the same as 2 tablespoons sliced green onions concerning the taste intensity. The onions are best rinsed under cool tap water and also it’s important that you remove any wilted or damaged tops on the white parts. When it comes to cutting the onions, it’s recommended that you lay several onions on a cutting surface and trim off the stringy root ends using a chef’s knife. As it was already mentioned, some people would rather try a recipe with a green onion substitute as they don’t like the taste of the green onions, or they just want to include some exotic choices in their meals. Therefore, the following list of green onion substitutes should help you make a good decision while considering the alternatives. Each green onion substitute features a unique taste and may inspire you to make your own original recipes which include them. Chives are best used for garnishes and raw dishes as they feature a distinct taste that is not too sharp but leaves a unique and pleasant feeling on your taste buds. The chives are not as crunchy as green onions, but among all of the green onion substitutes, they taste the most similar to green onions. Leeks feature a look that is quite similar to green onions but with the much wider stalks that are more leaf-like. The leeks feature a strong taste, similar to fully-grown onions, so make sure that you don’t overuse them in the recipe. This green onion substitute is recommended to be used only in a cooked dish where the flavors mellow differently. Ramps are foraged in the spring and present a sort of wild leeks which grow throughout Europe, Asia, Canada, and the Eastern United States. The ramps have an interesting flavor which is somewhere in between the onion and garlic flavors. The ramps are not appropriate as a garnish, so use them in a cooked recipe or sauce. This is the sweetest green onion substitute as it features a mild and sweet flavor which adds up to the overall deliciousness of your dish. The shallots should be used in small amounts and only as a substitution in cooked dishes. White or yellow onions are listed among the green onion substitutes as they can add up to the flavor balance if finely minced and used with discretion. Also, you can use red onions as they are sweeter and mellower. The red onions are best used for preparing a garnish on tacos or in salsa. All of the mentioned substitutes have specific recipes in which their full flavor potential can be emphasized. We will show you a few ways to prepare each green onion substitute and enjoy its full taste. The chives are best prepared if snipped with scissors instead of chopping them. Also, it’s important that you don’t subject them to much cooking as they will lose their delicate taste. Purple blue chive flowers can also be eaten and used as a garnish. One of the recipes which may introduce you the best to the taste of the chives is mushroom and asparagus risotto recipe. The leeks are easy to prepare as you only have to trim off the roots and the coarse dark green part of the tops, then cut the leeks in lengthways, wash them under a running tap and drain thoroughly afterward. Remember not to throw away the roots and dark green parts of the tops. If you want to feel the full taste of the leeks, check the creamy one-pot spaghetti with leeks recipe. One of the best ways to use the ramps in the recipe is to make a pizza with ramps, morels, and eggs. Also, if you like the taste of the ramps, you can pickle them and by doing so, preserve their taste. The garlic-like flavor of the ramps is well-combined with vinegar as the vinegar enhances the taste of the ramps, making them taste sharper. The ramps are also great when grilled in combination with white cheddar grits. This recipe brings the bright, onion-like ramps and introduces the springtime. As mentioned, the shallots have a milder, sweeter flavor than onions. The shallots are very versatile as they can be used in everything from pies and tarts to pickles, sauces, etc. If you want to taste the shallots at their finest, then you should check the shallot and red wine sauce which presents a magical flavor addition to rib-eye steaks. This recipe allows for the shallots to express their sweetness to the maximum and perfectly merge with the rest of the ingredients to form one of the best steak sauces out there. The white onions are known to have a very strong flavor, but in certain recipes, if prepared properly, they can be a slight, but noticeable addition to the overall flavor of the meal. One of the best ways to see how the white onions can make a discrete addition to the taste is to prepare them in a quick veggie risotto recipe. The red onions feature a specific preparation method which allows for their full taste. If you want to prepare the best red onions, you should slice them as thin as possible by using a mandolin. Then, stuff the onions in the jar and combine them with apple cider vinegar, salt, sugar, and warm water. What is the Right Substitute for Velveeta Cheese? It takes a delicious meal to mark an occasion and the right ingredients to make it special. The recipe has to cater to all tastes for everyone to enjoy the meal in your home. However, a well-planned cooking adventure can be ruined if the Velveeta cheese is not included. This can cause unnecessary stress for yourself because it would be difficult to accomplish your goals. The big challenge comes in to find the right substitute for Velveeta cheese. This cheese is versatile and tasty, but there are very few substitutes for it. It can be confusing not to find one in your local supermarket, which is why you must read this article to help you make the process of finding the right alternative a little easier. Are you tired of the same old cheese variety? The Velveeta cheese is perfect for all occasions. This cheese is loved by most people because it melts nicely, unlike most of the other cheeses which normally break apart. Velveeta might have a lot of real cheese elements, but it’s not real cheese. Velveeta cheese is an unmatched pasteurized processed cheese which has taken its rightful place in most people's hearts. Velveeta comes in a variety of products. So, don’t be surprised to see other products which have Velveeta in it such as shells and cheese, Mexican Velveeta, bacon-flavored shells, and Velveeta cheese slices. How to use Velveeta cheese? Velveeta cheese was invented in the 20th century by combining the leftover cheese pieces with whey. The cheese was marketed not as an individual product but as a sauce or dip ingredient because it melts better than the other cheeses. Now you are wondering how it is used? The answer is simple and it might surprise you. This cheese is used in several foods including the ones listed below. This meal has been a favorite one on many dinner tables. It features sliced potatoes, dusted with flour, salt, and pepper. Dried minced onion and thinly sliced Velveeta is also added. To complete the preparation, you can pour some milk around the edges of the meal and cover it with foil. Bake it until potatoes are soft. Lastly, remove the foil and continue baking until you see the top turning into spots of gold and dark brown. Nachos are kid-friendly and they can be made with Velveeta. You only need to add avocado, sour cream, cilantro, and Velveeta. If you are having a picnic, you can make cold baked beans and Velveeta cheese sandwiches. Another popular dish widely loved, and for you to have some memorable moments around a campfire is by having the Velveeta mac ‘n’ cheese. You can use Velveeta to make a queso fundido using a variety of cheeses. Velveeta has an easy melting quality which is not found in the other cheeses. So, you can’t get several types of cheeses that have different melting points to attain a silky texture. This is an ideal dish for the parties and you can use Velveeta and Rotel chiles to make a delicious meal such as a queso base. There are many homemade alternatives of the Velveeta cheese, which are easy to make and they have real cheese without the undesired preservatives. The ingredients include mild cheddar cheese, water, milk, gelatin, and cream cheese. Depending on how you want the finished substitute to look like, you can use either white or orange cheese. With Velveeta cheese, you’re assured of having tastier food, but if it’s not available, you can use these substitutes to have an excellent alternative. They are just as exciting as the Velveeta, and they would give your cheese the same processed texture. Cheez Whiz is a popular substitute for Velveeta cheese. It’s a soft mixture that is warmed and placed in hot macaroni, creamy soups, or vegetables. This processed cheese melts nicely and is a close substitute for Velveeta cheese. It’s perfect for sandwiches, dips, and snacks. If you are keen on making your own substitute for Velveeta that melts readily, use sodium citrate. You can add it to water or milk and make a solution. Then melt the cheese into the solution. The sodium citrate will ensure the emulsion is intact in the same way sodium alginate does it in Velveeta. Another great alternative would be to use gelatin to make the sheets and milk. You can heat the liquid which is either milk or water with sodium citrate to dissolve it. Then blend in grated cheese ensuring it melts. With a lot of whisking, you can get a perfect substitute for Velveeta cheese. However, you can avoid making your own substitute for Velveeta cheese by using other types of processed cheeses. A great option includes extra sharp cheddar and Swiss sharp cheddar. Or else use different varieties of young and soft cheeses such as Gouda. This melts well and you don’t need to add any other ingredient. If you can’t find Cheez-Whiz anywhere in the supermarkets to use it as a substitute for Velveeta cheese, there is no need to worry because you can also make it at home. The steps below will show you how to make this great substitute for Velveeta. Pour the evaporated milk into a saucepan and simmer it. Use a blender to mix the cheese, cream cheese, dry mustard, and salt. Pour the simmering evaporated milk and process it until it’s smooth. It can then be poured into a jar and use it as quickly as possible. To get a thinner mixture, top up with some more hot milk or cream. It can be stored in the refrigerator but use it within a week. When the shredded cheese is opened, keep it close-by so that you can add it instantly. This is because the mixture doesn’t take long to thicken. If you are using a blender that is not suitable for making thick mixtures, use a food processor instead. Cheese has always held a special place in people’s history, and it’s not a coincidence that it’s one of life’s great luxuries. So many varieties and all with their own taste, it’s just mind-blowing. The delight is great when the cheese is made perfectly to suit your taste. The comfort of home is the perfect setting to sit down to a family meal which has a homemade blend of cheese flavors. If you are passionate about cooking, it’s time to indulge, guilt-free in making your own cheese, which is easier than you might have imagined. Making your own cheese should not be a chore when you are using the best cheese making kit. When you have got all the tools set on the scene, all you need is just to go ahead and make that favorite homemade cheese to satiate your taste buds. Let’s explore the best cheese making kits to have an informed decision before purchasing them online. A winning combination of design and simplicity should put the best cheese making kit on the global market. The cheese making kits evolution has been a natural progression which has resulted in modern design with high-quality tools. By making your own homemade cheese, you are getting a better taste that suits you. Your cheese making kit should have everything you might need for making any particular type of cheese. Besides, it also needs to have all the necessary equipment. The best kit has everything in it to start and complete the process of cheese-making. There are many highly reputed brands on the market. However, these kits come with unique accessories like cheesecloth, gloves, and ingredients. This might look like a difficult choice but these kitchen inventories will help you select the right cheese making kit. A high-quality pot such as one with stainless steel or a heavy enamel is needed. This has a heavy bottom which helps in dispersing heat evenly without scorching the milk. It allows a steady and slow rise in temperature. The bottom-line is to have a pot that is non-reactive to bacteria or inorganic chemicals like aluminum or copper. You should look for pots that have a glass lid for easy peeking inside the pot. Since there are a variety of kits from manufacturers, some of them don’t include the pots in their packages. This means you have to buy them separately from any local supermarket. Cheese making kits come with different accessories and having an assortment of measuring cups and spoons will make the process easier. These items will help you to have accurate measurements for a perfect cheese that suits your taste. A dairy thermometer has a distinct design as it has a small range that reaches 220 degrees. Cheese making involves cooking and cooling, so a smaller range ensures that there is no room for error. It gives accurate readings which are crucial when you are handling cultures that are heat-sensitive. The texture and taste of your cheese can be affected with a sudden slight change in temperature. You should ensure that the thermometer you have is made of good quality. Analog thermometers are not a good idea in cheese making as they don’t give accurate readings. The better quality the item, the tastier the cheese will be. The size and design of the perforated ladle will determine the quality of your cheese. This tool can be used for scooping curds from whey. The cheese making process involves a lot of stirring, so you need it. Just like the pots used to make the cheese, a perforated ladle needs to be of high quality as well. You should get a spoon which is not reactive, so stainless steel is the best option. Once the spoon becomes reactive with the acidifiers such as bacteria, the cheese making process will be ruined. Now that you have separated curds from whey, you will need cheesecloth to drain the whey from the curds. The cheesecloth should do this faster and evenly. However, avoid the cheesecloth that is too thin and open as this will let the solid curd slip through. Cheesecloth is reusable and can be washed by hand or machine. Even better, you can use a butter muslin which has a better performance than the ordinary cheesecloth. Both items can be used interchangeably, but they have particular uses. Butter muslin is more suited to soft cheeses. If the cheese making kit doesn’t have either cheesecloth or a butter muslin, you can get one from a supermarket. However, add some pieces at various angles to reduce curd loss. This tool is designed to press on fresh curds to get the milk out and let the curds bond to form cheese. If you decide to make a hard cheese, you will need a cheese press. They are extremely simple to use while having a superb homemade cheese. There is no doubt that you will need a cheese press if you are making hard cheese. If you are homemaking cheese, you will need to get a colander. It’s not used a lot during the process but it will make your life a lot easier. You can pour the curds into a cheesecloth-lined colander, and hang the cheesecloth. However, if you are pressing the curds, then the best option is using the cheesecloth or butter muslin. The colander can still be used before pressing to drain the excess whey from the curds. While making cheese, you have to consider the type and quality of the cheese you want to have. There are several tools in the kit that are needed to make the process easier and successful. It becomes clear why most knowledgeable people find pleasure in using the best cheese making kits. This is a well-designed kit which comes with everything except milk. The Mozzarella and Ricotta Cheese Making Kit features 8-oz citric acid, cheese salt, 10 vegetable rennet tablets, a thermometer, a yard butter muslin, and a recipe booklet. All these are just enough to make your favorite cheese at home. It’s a great kit to make cheese. It comes with plenty of ingredients to make many batches. It’s easy to make Mozzarella and Ricotta cheese using the kit. You can make a huge 30 batches with it. 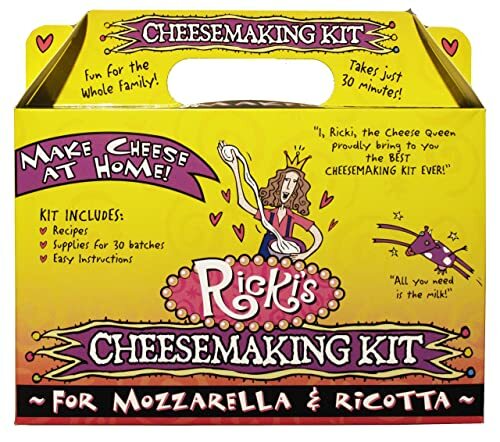 There is sheer diversity in the variety of cheeses you can make with Rickis Basic Cheese Making Kit. You can make 10-pound batches of different cheeses including Farmhouse Cheddar, Feta, Gouda, and Monterey Jack. It has enough ingredients and tools to make cheese. It comes with simple instructions. It’s easy and fun to use the kit. It doesn’t come with clear instructions. This cheese making kit has an abundance of accessories including a cheese press which is made up of Maple hardwood. It also comes with two food safe PVC hoops, Mesophilic and Thermophilic cultures. It comes with plenty of accessories. It’s durable as it’s made from hardwood. 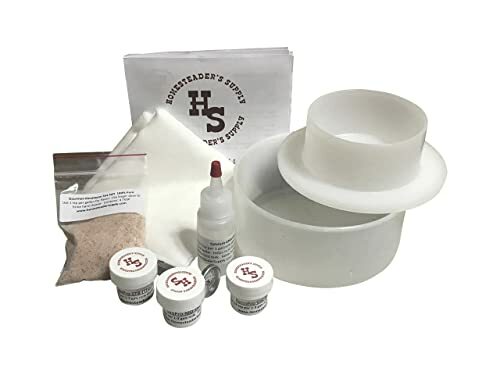 Homesteader's Supply Best Basic Cheese Making Kit found sure footing here as it provides all that you need to make a piece of delicious cheese. It comes with about a gallon of milk, Mesophilic and Thermophilic cultures, rennet, cheesecloth, a thermometer, a press, and instructions. It’s a great basic kit. It has easy and straight-forward instructions. It comes with quality ingredients. It’s quite pricey for a basic kit. 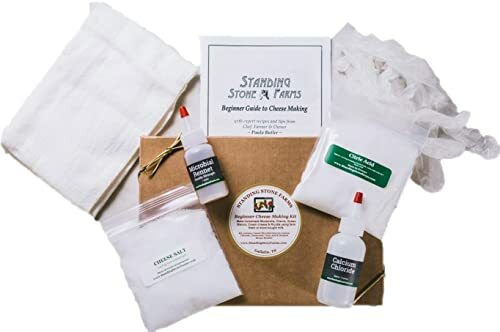 The Standing Stone Farms Basic Beginner Cheese Making Kit blows most of the kits out of the water. It has enough ingredients to make an awesome cheese such as Mozzarella, Goat Cheese, Queso Fresco, and Ricotta. It features cheese salt, citric acid, drain cloth, and disposable gloves. Making cheese means you have to withstand the heat on your hands, so the gloves come in handy. It’s a great beginner’s kit with clear instructions. It’s not suitable for advanced cheese making. So, the detailed review of the best cheese making kits must have kept you busy and you must have zeroed in some of the best options from the list. After all, the very idea of preparing cheese is so tempting. It’s evident that all the kits scored high points in most of the fields and they are all high-quality products. However, there can only be one kit that comes on top, and this one was Standing Stone Farms Basic Beginner Cheese Making Kit. 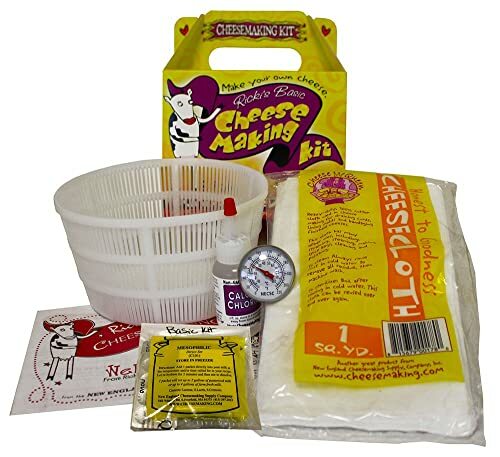 Being a kit that provided most of the basic ingredients and extra tools, this cheese making kit prevailed over the other kits by a minor margin. The disposable gloves, drain cloth, enough ingredients for 25 gallons of milk, along with the different types of cheeses you can make give it the edge over the other kits. Whether preparing a meal for yourself, or a lavish dinner for your family, mascarpone cheese makes the occasion special if you use it as an ingredient. In such situations, you might end up with some leftovers of the cheese from the recipe. Mascarpone cheese is relatively easier to make than the other cheeses, but it requires a lot of time. For that reason, most people think they would rather make a large batch and freeze it for a couple of days. The problem is can you freeze mascarpone cheese that can be used later during the year? Some people insist that freezing it could ruin the cheese. This can take a big toll on those who love the soft cheese as to what to do with it. Keep reading to find out the truth on whether freezing mascarpone cheese is the only option for you or not. What is mascarpone cheese? Cooking with Mascarpone cheese Can you freeze mascarpone? Mascarpone cheese has its origins from Northern Italy. There are a lot of theories about how the name came into existence, but one thing remains clear, this cheese was first made during the Renaissance period. You can make mascarpone cheese from only two ingredients which are whole cream and citric or even tartaric acid. Since it’s quite simple to make, most people prefer making it at home, and it can be stored in an open container for a few days. A well-made Mascarpone cheese should be smooth without lumps. It has a milky, sweet, and tanginess flavor. Its buttery flavor comes from the high content of butter. However, people who have tried to make this cheese admit that it tends to go bad quickly. This cheese doesn’t have rennet, so it’s loved by most vegetarians. While rennet is commonly used to cuddle different varieties of cheeses, Mascarpone cheese uses an acid which you can get from either the fruits such as a lemon juice or you can use tartaric acid. You can use mascarpone cheese in most of the desserts including tiramisu. 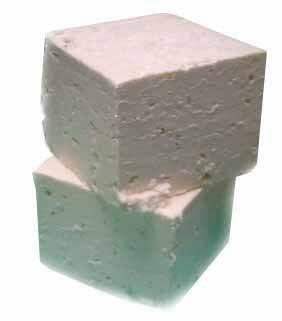 It is a suitable replacement of cream cheese for those looking for a lighter and fluffier result. This is versatile cheese which was developed over many years ago to be used as an ingredient in the Italian dessert called tiramisu. No caterer, chef, housewife, or restaurant should be without it. It’s one of the most loved cheese you can ever find. Apart from tiramisu, you can use mascarpone cheese on sweet and savory meals, leaving you to enjoy the cheese on all your favorite dishes. With its creamy element, it’s a suitable addition to pasta. You should use it alone or together with a sauce. Now, a meal you can be proud of is only moments away when you use mascarpone cheese. If you want, you can also use the cheese as a replacement of cream in a lot of pasta dishes. With mascarpone cheese, you can’t go wrong as you can make your dishes such as lasagna, baked rigatoni, and macaroni rich and creamy. If you enjoy thick soup, you can use this cheese to have a creamy dip. Leaving space for dessert becomes mandatory when you consider this delicious cheese. One of the perfect ways to enjoy eating the cheese as a sweet dessert is by decorating on top of it with cocoa powder and chocolate shavings. Mascarpone cheese is so appetizing and full of flavor that most people wouldn’t stomach seeing it going to waste. While the cheese is not considered as the best item for freezing, there is a way you can preserve it. So, everything boils down to can you freeze mascarpone that has been leftover? If you can’t resist a delicious meal with this cheese, freeze it. Since this is a soft cheese, the liquid and the solids separate from each other. However, you can whip the frozen mascarpone to restore its texture. There are few kinds of soft cheese that you can successfully store in a freezer and mascarpone is one of them. Still, you will need to take some precautions when freezing it such as sealing the cheese in an airtight container. 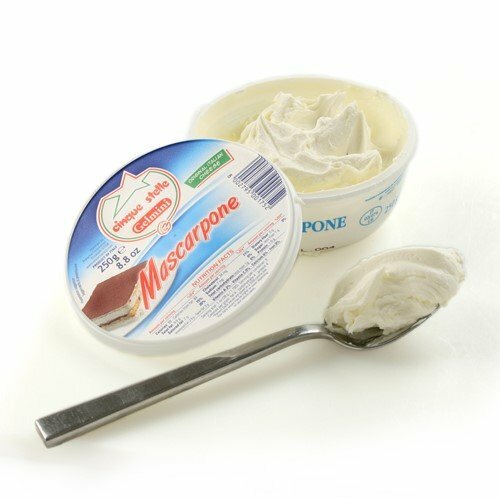 The mascarpone cheese which is open can be sealed tightly in its original container. Nevertheless, that’s not all as you need to pack it inside a plastic freezer bag to reduce the risks of it getting the freezer burn. By now, it shouldn’t bother your mind to the question can you freeze mascarpone cheese which has been leftover? But, you need to consider the following steps. If the mascarpone cheese is not open, leave it in its original package. However, if they are the leftovers that you are freezing, place the cheese into the freezer bag. Squeeze out the air inside the plastic freezer bag before sealing it tightly. The air is the culprit for causing freezer burn. Label the freezer bag with the date and name of the contents. The expiration date should also be indicated which is about three months after storing it in the freezer. If you want to remove the mascarpone cheese, let it thaw in the refrigerator. After six to eight hours before you can take it out. Pour it into a mixing bowl while it’s still cold. You can whip the cheese with the electric mixer to recreate its original structure. The whipping process should be done for one or two minutes until it appears thick and creamy once again. The idea is to use mascarpone cheese which is almost in a perfect condition. Before using it, remove the cheese at least 8-12 hours earlier. Once it has thawed thoroughly, use a spoon to put it in a bowl. At this point, the cheese should have separated and some grainy texture might be present. So, use a whisk to whip it until it separates and gets back to its original texture which is light and fluffy. Now, you are ready to use the mascarpone cheese as a recipe. Can Cotija Cheese Substitute Queso Fresco? Cheese lovers want nothing more than to enjoy making a delicious dish from their favorite type of cheese. Most people love Mexican cheeses as they have distinctive characters that they add to various dishes. Have you heard about queso fresco? Well, this is one of the perfect Mexican cheeses to have on hand, especially if you are a fan of grilled foods, salads, and soups. It makes it easier for everyone to sit down and enjoy a meal of indulgent goodies. However, most people who make Mexican recipes admit that it’s sometimes hard to locate queso fresco in their local supermarket. There are many other varieties of cheeses that you can use as a substitute for queso fresco, but most of them don’t give the exact flavor. The best you can get is the cotija cheese substitute queso fresco. So, let’s see if cotija is the ideal alternative to queso fresco cheese. What are queso fresco and cotija cheese? How to use queso fresco Can Cotija cheese substitute queso fresco? What are queso fresco and cotija cheese? Queso fresco is a soft cheese that is known for its mild tanginess, saltiness, and crumbly texture. This is a fresh cheese which is traditionally made from either cow’s milk or a mix of cow’s and goat’s milk. The production process is quite simple as the milk is acidified first. It’s then left to curdle before straining it in cheesecloth and you then press it. If you are making it at home, you can use it immediately or let it age for a couple of days. But, traditional queso fresco has the reputation of not holding it for long, so it’s a good idea to use it in your recipe as soon as possible. The queso fresco cheese that is found in the supermarkets is in proper packages to last for a long time. Cotija is another Mexican cheese that is sometimes referred to as the Parmesan of Mexico. It’s dry grating and salty cheese which has a crumbly texture. It adds a layer of flavor and creaminess to a lot of dishes, making it an ideal cheese to have around. The traditional cotija cheese is made with cow’s milk. The cheese which is named after the Mexican city known as Cotija takes at least 100 days to age. It has a long shelf life even if its package is open. Queso fresco is a perfect ingredient to several dishes as it brings salty-sour kick, slightly acidic flavor, and its creamy characteristic provides freshness. It can give contrast to heavier dishes such as enchiladas or it complements light meals including salads and grilled vegetables. The best way to use queso fresco is by crumbling it on top of beans, rice dishes, and salads. In Mexico, the cheese is used with Chilaca chiles which are mild dark green. This involves charring the chiles which are then cut into thin strips. They then mix them with some other ingredients such as fresh lime juice and white onion and left alone for 30 minutes. You can eat it as a snack or side dish to fish or chicken. You don’t need to do any cooking at all. Cheese is so important to many people that eating as many varieties as possible is the only way of appreciating the flavors. However, it would take you a lot of searching to find the exact substitute of queso fresco cheese. This cheese tends to taste more of milk than cream or butter. It’s not surprising that this delicious flavor attracts people to find out more about Cotija cheese substitute queso fresco. The good news is that most of the Mexican cheeses including cotija are uniquely salty. The thing is, queso fresco is fresh and it’s not dry like cotija cheese. Nevertheless, you can crumble queso fresco and cotija in the same way. Plus, queso fresco is softer, mild in flavor, and a bit creamier than cotija. Okay, so both cotija and queso fresco are technically Mexican cheeses, but queso fresco is suited well for frying or grilling. As you can see cotija cheese substitute queso fresco is the best option you can have. Cotija which is an aged cheese is ideal for the creamy and salty topping to salads and enchiladas just like queso fresco. Both kinds of cheese are salty and they have a crumbly texture. You might have seen queso fresco in various Mexican dishes, displaying a beautiful sprinkling of whiteness on top of a dish. This is a mild cheese and versatile. Since it’s milky, it offsets the strong flavor from chiles and spices commonly present in most of the Mexican dishes. Queso fresco has a sour taste making it a favorite for fresh salads. It balances the richness of most dishes, helping you to enjoy a meal in your own home. This is why some people enjoy putting the cheese on almost every dish or as a replacement for goat cheese and ricotta. You can eat the fresh queso fresco, and store the leftovers to prevent them from going bad. In such a situation, take the following steps. Wrap the cheese tightly in a plastic freezer bag and make sure you squeeze out as much air as possible. Keep the cheese in the refrigerator for up to two weeks. Queso fresco gets soft when you heat, but it’s hard to melt. You can still melt it with low heat for some time. The cheese will turn into a sauce or cheesy dip; however, it will still have its chunky state. You can then stuff it into chiles. In case you want to use queso fresco for topping, here are some of the dishes you can use it on. Toss queso fresco into a salad. Instead of using the usual options such as feta, this cheese makes an ideal alternative. Use the cheese as a garnish for soup. It’s perfect for either a cold summer soup or warmer soups. Roll queso fresco onto corn by covering every kernel. You can crumble it atop Mexican dishes to reduce the heat. A big variety of cheese is available on the market that excites your taste buds, and ricotta cheese is one of the finest. “A whole new meaning to delicious food” is the phrase that most people who use this cheese as part of the recipe speak about. If you happen to have leftovers of ricotta cheese in your home, it can be mind-blowing to think about what to do with it. It’s quite bothering to be in such a situation because ricotta cheese is known to easily go bad if you don’t store it properly. So here is the thing, can you freeze ricotta cheese? Well, all is not lost as there is a way that you can use to keep ricotta cheese in good condition. It means you don’t have to worry about throwing the leftover ricotta cheese in the bin. Keep reading to find out what you can do to prolong its life. For those who are hearing ricotta cheese for the first time, the name ricotta is from Latin which means “cooked twice.” This is a fresh and soft cheese which is you can make from either the cow’s milk or skim milk. Ricotta cheese has a relatively smoother texture than most of the other varieties of cheese such as cottage cheese. The other unique thing is that it has a slightly sweet taste and a pearly white color. To know if you have a good quality of ricotta cheese, check if it’s firm and it has fine granules. It’s easy to identify the ingredients after tasting this tasty creamy white cheese. You will have memorable moments when you take ricotta cheese in Lasagna and cheesecakes. The question is, can you freeze ricotta cheese? It’s actually possible to freeze ricotta cheese. Like most of the natural foods, you can freeze the ricotta cheese to prevent it from going bad. However, it affects the quality of the cheese. It’s texture changes but the flavor remains the same. Ricotta cheese is pretty soft, so freezing it transforms the moisture into ice. If you choose to freeze ricotta, expect the damage to the shape of the cheese because of the ice that forms. The alters in texture can be seen once you thaw it. People who try to freeze it have a lot of things to say about the damages in texture. The good news is that you can attempt to save the damaged texture by stirring it with a spoon. Unfortunately, the grainy texture will still be felt by some people as it doesn’t completely go away. So, the next time you have leftovers of ricotta cheese, put them in a freezer, of course, for safekeeping. Most supermarkets use a plastic container to package most of the ricotta cheese. This ensures that its quality remains intact. If the package is not open, there is no problem freezing it directly. But, can you freeze ricotta cheese which has been leftover? Yes, you can. If you want to freeze it, then you need to put the cheese in a freezer bag or an airtight container. To freeze ricotta cheese, here are some interesting steps that you may not have known and you need to follow. If the ricotta cheese is still in its original package, freeze it directly into the freezer. However, if it’s open, then stir it with a spoon and you should drain the excess liquid by pressing it down. This will help the cheese to freeze more evenly. Wrap the cheese in plastic before storing it in a freezer bag or an airtight container. It’s ideal that you portion the ricotta cheese for easy defrosting. You must press out the air before sealing it. Label the freezer bag or container with the date of storage. It’s recommended that you should not store the ricotta cheese for more than two months. You should thaw the frozen ricotta cheese in the refrigerator. Never thaw it on the counter as it will only help increase the growth of bacteria. Mix the cheese with a spoon to reconstruct whey and curds which were separated. Use the cheese before two days elapses to avoid it going bad. You can store the cheese which you didn’t use in the refrigerator for the second time, but it has to be up to seven days. There is no limit to the ways you can store ricotta cheese. It can be frozen using several materials including an airtight container, aluminum foil, plastic freezer bag, and plastic wrap. The plan is to go out of your way to make sure that you maintain high quality. The best way to do this is to portion the cheese into smaller sizes which are about eight ounces. Some of the ricotta cheese can be put into ice cube trays using a spoon while you can place the small portions in airtight containers or freezer bags. Foods are always safe for consumption if they are kept in temperatures of 0 degrees Fahrenheit and below. Great care should be taken because the quality of ricotta cheese gets affected a month after been stored in the freezer. The color and texture alter, and this makes it not that delicious as it was supposed to be. It’s only good that the leftovers of your ricotta cheese don’t go to waste. While freezing has nothing to do with the taste and quality of the cheese, the freezing and thawing process does affect the structure of whey and curds. Most people are still delighted to freeze the ricotta cheese. It has a lot more to offer than you might have realized as it suits perfectly for cooking recipes even better than fresh cheese. What is the Right Substitute for Goat Cheese? Cheese lovers know that it can be difficult to find out that your favorite cheese flavor is not available in the local shops. For those who are imaginative, they create alternatives to make their meals special. While some people don’t like the taste, smell or even texture of goat cheese, others are fans of this delicious cheese. Goat cheese comes in different forms, and it has been around for many years. Today, the name chevre refers to the goat cheese. Since it can always be challenging to find this cheese in the supermarkets, this is why knowing the right substitute for goat cheese will save your day. If you’re a goat cheese lover who couldn’t find any of it to make a recipe, this post will help you know the substitutes that you can use. Unlike most of the other cheeses which are made from cow milk, goat cheese implies a type of cheese from goat milk. The cheese is a firm people’s favorite as it has a strong and unique flavor. The other outstanding thing is that it has a special texture that is difficult to find in the other varieties of cheeses. From the moment you take the first bite, the goat cheese melts in your mouth, releasing a flavor and texture that is divine. Ideally, it’s no surprise that it’s hard to find an exact substitute for goat cheese because of this fact. If you are lucky, you will come across some cheeses with a similar flavor, if not then the texture might be similar. This means choosing your recipe will be on the preferences of an individual. When preparing everyday meals, goat cheese is a rich treat that makes any occasion special. It has low fats, calories, cholesterol, and carbohydrates. Most people love it because it’s easily digestible. The list below shows how you can use goat cheese. Goat cheese has a lot of flavor and creaminess, which makes it suitable as a spread on bread. You can make a pizza with goat cheese. You can also use it together with pesto, butternut squash, and greens. You can wrap up goat cheese together with roasted vegetables such as grilled mushrooms and eggplants. This will make a delicious meal and superb for the dinner table. You can top salads with goat cheese. The salads such as steak and potato salad together with goat cheese are complete meals. Some are unique in that their imaginative combination you can serve them warm. Others are fresh and natural, making them perfect cold salads for light meals. As mentioned earlier, finding a substitute for goat cheese should focus on whether you are trying to get either the flavor or the texture. It’s almost impossible to preserve both of them in the recipe. This a type of soft cheese with a creamy texture, and it easily comes as a substitute for goat cheese. However, it lacks the acidic and tanginess flavor that is in goat cheese. What you can do is to add yogurt to the recipe to get that sharp flavor you need. Feta cheese is produced from sheep’s milk. It’s traditionally crumbly, salty and creamy. If you can’t stand the smell of goat cheese, this is a better one for you. It’s also considered one of the healthiest cheese in the world. These two varieties of cheese are quite different because you’ll have to mix them. Despite the fact that it involves a bit of work to combine them, the results are worth it. The mixture has the right taste of salt and texture. Plus, you can add some herbs and spices to get the flavor. This one is definitely the people’s favorite. There are several substitutes, but the ones listed below share closer similarities with the goat cheese. So, next time you are doing a substitute for goat cheese shopping, put a healthy helping of these cheeses in your basket. Cream cheese has a similar flavor to the goat cheese, however, its texture is pretty different. This suits well for dessert, so your creativity can come into play, especially when you are making sweet foods such as cheesecakes. Most people consider Cream cheese as a suitable substitute because of their close taste similarities. You can use it on bread including toast and bagel. If there is another favorite substitute for goat cheese, then it’s Ricotta. The name means “recooked.” It has almost the same smooth texture and a slightly sweet taste that comes with it. You won’t run out of ideas because Ricotta is quite versatile. It’s great in sweet foods such as cheesecake and pies. It can also be used in savory foods including pizza, toast, and pasta. You can make ricotta cheese from either cow’s milk, sheep’s milk, or even goat’s milk. If you are trying new recipes, make sure that you follow these tips. This will help you get the right substitute for goat cheese. You can soak in water or milk some varieties of cheeses as this gives them the texture which is more creamy. This can be done in cheeses such as Feta cheese, but use a small quantity of it before using the entire block to assess the results first. You have a chance of getting away with various textures if you do your homework right. It’s important to know whether the cheese is going to be used cold or hot. You can have different textures when you melt the cheese. Even if it’s going to be mixed into the recipe, expect to get some unique textures. What To Serve With Cheese Souffle? There is something about cheese souffle that always makes me crave for it. It doesn’t matter how I prepare it, the results are always tasty. I have been making them at home for years and adding to it all the delicious flavors of the season. Cheese souffle is a firm favorite savory dish with an amazing flavor and texture. However, it’s surprising how few people know what to serve with cheese souffle. There is no limit to the ways you can serve this decadent delight. It is made from three types of cheese which are Cheddar, Swiss, and Parmesan. They are usually used to boost flavor and make the meal special. Let’s see how you can prepare and what can be used to serve with cheese souffle. How should I serve a cheese souffle? A cheese souffle is airy and fluffy. This dish is amazingly versatile and it can be served at lunch or supper. Some people are imaginative and love to use it as a starter, a main dish or a savory. What can I say, I love cheese souffle because it’s economical as it’s tasty and easy to make. It’s fabulously fortifying without being filling. You can prepare it in a large souffle dish or in smaller dishes. The trick is to make sure that everyone is prepared to eat it once you take it out of the oven. The dish doesn’t tolerate to be too late to the dinner table. To make a cheese souffle, you have to master three important easy techniques. Making a sauce of egg yolks, beating egg whites to create firm peaks and folds, and a way in which the egg whites are mixed into the sauce. A cheese souffle needs to be assembled and baked before serving. They are made with heavier ingredients, which makes them vulnerable to disaster. If they are assembled very early, the cheese will be at the bottom while the fluffy egg white mixture will be at the top of the baking dish. A cheese souffle is an excellent and affordable standby and can be turned quickly and easily into an exciting meal. If everything such as a pan, electric mixer, and ingredients are ready, it takes almost 15 minutes to assemble a cheese souffle from start to finish. A dish that serves four to six people takes about 30 to 35 minutes to cook. Because baking cheese souffle is touch-and-go, timing is everything. If the egg whites are floppy, it will not rise. You will have soupy stuff if it’s underbaked, and if it’s overbaked, it will collapse right in the oven. Perhaps the oddest thing is that if it will fall within moments if you delay taking it to the dinner table for your guests. People will doubt you if you tell them how high it was when it first came out of the oven. The only thing you can do is to hope for the best and prepare for the worst. However, if you are preparing a cheese souffle for your guests, try a couple of test runs. After a few attempts, you should have it mastered. A collapsed souffle doesn’t look great, so you wouldn’t want to serve it. Here is a strategy you can use. Let the cheese souffle bake, keeping it undisturbed for about 80 percent of its estimated baking time. Then, for the rest of the cooking time, check for the crown that it’s perfectly browned. The crown eventually collapses when you remove it from the oven, and below it, you will see a flat, heavy layer of cheese. Lastly, shake the dish to make sure that it’s not wobbling a lot. Now, there is no time to waste. Even the cheese souffle which has been perfectly cooked will collapse eventually. So be prepared to serve it once you take it out of the oven. Souffles that are cooked individually should be placed right on the serving plates and taken to the dining table. A large souffle should be taken to the table. A serving spoon and fork should be used to cut it in the center. The dish is less likely to crash if you cut it right in the center as opposed to cutting it around the edges. Cheese souffle is superb for the dinner table. I tend to eat it as a light supper. Serving them with fresh green salad or sausages makes them perfect for a light meal. What to serve with cheese souffle depends on your taste but it can also make a nice starter to a formal meal. Crusty French bread can be served with cheese souffle. If you want to have soup, keeping it simple is the way to go and the traditional tomato soup is a perfect one. It is the same type of soup that is served with a grilled cheese sandwich. Because cheese contains some natural salt flavor, the best to serve with cheese souffle is by having a crunching salad that has apples or pears. Some people serve it with crusty French bread, homemade chutneys, a fresh cucumber, and courgette pickle. Taste differs because some people love it served with baked beans, fresh salad or crispy bacon; either way, the results are delicious. So, don’t be afraid to try it out as it is completely worth it. Inside the heart of every cook, there is a determination to make a perfect meal. So, next time you are baking a cheese souffle, don’t shudder at looking at the other ways of What to serve with cheese souffle. Such a rich treat should ideally be prepared at home, leaving you with plenty of time to revive the lost art of home-made dishes. Other cooks guarantee success with their tried methods. However, few of them agree on what the perfect method should be. While I might not recommend inexperienced cooks to take on cheese souffle as a project, practice makes perfect. So, three or four of them under your belt will give you all the confidence you might need. Copyright text 2019 by Grassfields Cheese.